On its face, ROI seems pretty straightforward – a basic math equation that determines the ratio between an investment’s profit and its cost. But with legal technology, this can get a little nebulous: Your department deals in time, not in widgets. Indeed, ROI is the language of the C-suite, and it’s imperative for in-house lawyers to show fluency. (Recall that one-third of CEOs and directors rank “controlling legal spend” as a top-three priority for law department performance.) 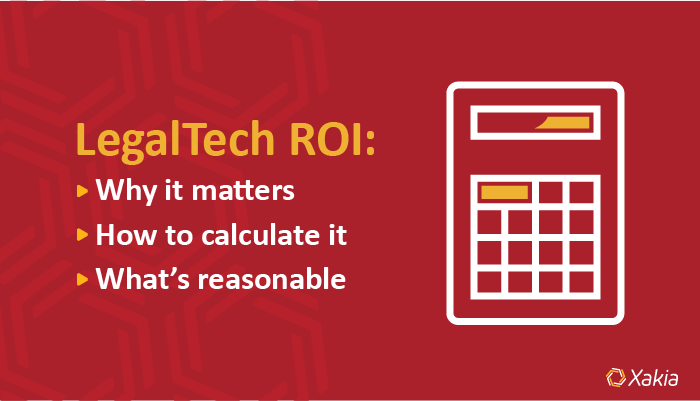 You need to know your ROI to demonstrate that you are a good steward of company resources, to test and validate your decision-making, and to inform future projects in your legal technology roadmap. There are two factors behind legal tech ROI: time and money. Because your department’s output is units of time, your first step is to understand the cost of this time. If you have access to specific HR data, you can nail down the exact cost of your department’s time spend. Without it, you can make a good estimate with industry averages. How many hours will each user spend on this solution each day? How many hours do we think this solution will save each user each day? How much will this cost per month? Does this eliminate work we had to pay an outside firm to complete, or save any other hard costs? Once you have these answers, ROI is a few calculations away – no matter what stage your project is in. The formula is below – or you can try Xakia’s LegalTech ROI Calculator, which will do the math for you. Your answer will show you a percentage return. For example, if you generate an ROI of 75 percent, for every £1 invested in this solution, the company will realize £1.75 in benefit each year. To determine how fast your legal tech will “earn its keep,” it’s helpful to calculate the payback. Start by calculating your monthly savings by dividing the net annual savings by 12. Determine the number of months until payback by dividing the investment by the monthly savings. Of course, no mathematic equation can account for all of the nuances of a legal department, its processes and most importantly, its personnel. Your ROI may be higher as you find new uses for the tool and as users become more efficient with it. Moreover, this formula only covers one year; a software solution likely would generate benefits for multiple years (but we’ll spare you any “net present value” advanced calculus). Your ROI may be lower if the technology doesn’t work as expected or if user adoption stalls. Recall that user involvement is 15 times more critical than having the right tools – although there’s no accounting for attitude or aptitude in the ROI equation, both factors will have a major effect. Every company will have different expectations for ROI, but it’s helpful to have a target in mind. Rhonda Robati, the chief revenue officer of Velpic Inc., said ROI for technology investments typically range from 47 percent to 87 percent; as a best practice, she said any technology investment should have an ROI of at least 65 percent. In other words, you want at least £1.65 for every £1 spent. But remember to think beyond the numbers. Any quality in-house legal technology solution should bring myriad benefits that won’t show up in an ROI calculation: less stress, happier staff, happier business clients and fewer missed deadlines chief among them. Numbers matter, but quality intangibles can be the ultimate return.